Scripture clearly testifies that what we call "worship" is actually instigated by God, as He throughout history gathers his people together to dwell with them (Exodus 20:24; Exodus 29:46). This dwelling God centers on two pillars: (1) instruction in the Word and (2) sacramental eating. 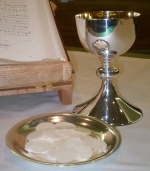 The entire Scriptures testify to this truth and, to this day, the church gathers around the Word proclaimed and the sacrament given for Christians to eat and to drink. Thus, during the Reformation it was called Gottesdienst - God's service - because here we are served by Christ himself: "The Son of Man came not to be served, but to serve." Today, we call it the Divine Service, understanding that God has divinely obligated himself to serve sinners in the liturgy of the Church. The word comes from the Greek 'leitourgia' (in Roman times, a tax or financial obligation paid by one for the benefit of many) and refers to the fact that God is each Sunday obligating himself to serve the many. Whether spoken or sung, the Church's language will always be "liturgical" as long as it points us to how Christ has here and now obligated himself to serve us - through Word and Sacrament. All are invited to join us in the hearing of the Word and learning of the Sacrament for all to partake of in a unity of confession... in short, all are invited to be served by Christ himself!